It Comes to Human Rights? 1- United Nations (UN) organs namely the Office of High Commissioner for Human Rights (OHCHR), UN Human Rights Council (UNHRC) and UN agencies such as the International Labor Organization (ILO), United Nations Educational, Scientific and Cultural Organization (UNESCO), United Nations Children’s Fund (UNICEF), World Health Organization (WHO) among others. All these institutions play a role with certain aspects of human rights that should not be overlooked or understated. 2- International human rights Non-governmental organizations (NGO’s) which operate internationally such as Amnesty/Human Rights Watch (HRW)/ Human Rights First (HRF)/ International Federation for Human Rights (IFHR)/ Article 19 / World Organization Against Torture (OMCT) / Human Rights Defenders, etc. 3- Some states and particularly in the Western world which tend to apply its own model and vision through the application of human rights and democracy standards. These countries have a strong impact on the UN and international media and acquire the ability to impose sanctions on countries and to politically exploit the human rights blunders of their foes. It also have an influence on UN agencies, international NGO’s and even local ones in some countries from a funding, education and training perspective. These countries also have special monitoring mechanisms of human rights conditions in every country. Furthermore, the Ministries of foreign affairs in some of these states publish quarterly or annual reports on human rights which have now become a focal part of their foreign policies. It must be noted that these states are also subject to domestic pressure from human rights organizations, parliament, media or even rival parties to adopt certain stances regarding a specific country or a particular human rights issue which means it has an impact on these human rights institutions. These states do not work in a secluded world as they put pressure or are subjected to it whether it is related to their own human rights record or that of others including its allies. 4- Let us take local and regional human rights organizations such as the Arab Human Rights organization and the Cairo Institute for Human Rights (CIHR) and human rights groups across the world. All these groups have some sort of a link to the UN, states and international human rights organizations. They are therefore partners in the international human rights system and cannot be separated from it or underestimated or viewed as a tool in the hands of other countries. 5- There are also the local and regional professional organizations, particularly the international ones such as the International Bar Association (IBA), International Federation of Trade Unions (IFTU), Federation of International Physicians, Reporters Without Borders and Transparency International (TI). 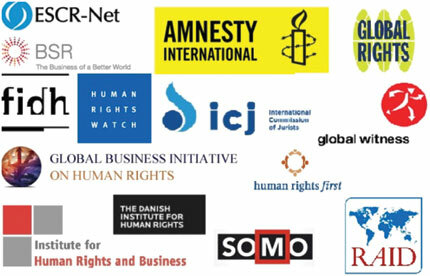 All these entities are concerned with what is going on in Bahrain and other countries. They are monitoring, following up on complaints, putting pressure, calling for reforms, contacting the media, pressing states, issuing reports and communicating with stakeholders in all countries whether they are NGO’s, government, activists or human rights defenders. Human rights organizations represent a link in a chain of pressure that may begin with one person somewhere in the world whose work ripples through to the highest level of international attention. a- A case could start with an incident of human rights violation that is picked up by a local human rights activist who demands an investigation into it and a halting of the abuse. Soon enough, this becomes news and is transmitted to local and international human rights organizations with an interest in this case. b- Domestically, people are mobilized against this incident and depending on its gravity, demonstrations or other forms of objections, whether legal or popular, might erupt on the ground. Based on the official response, the reaction could either be stepped up or subdued. c- On the home front as well, the incident could be handled through the legal mechanisms taking it to a certain path which would be dealt with by lawyers, whereas some political forces could, simultaneously, seek to exploit the situation and launch a criticism campaign against the authorities, promoted through popular and electronic media outlets. If the authorities do not move to explain the circumstances surrounding the violation or clarify their position or modify their behavior or initiate an investigation and choose, instead, to maintain silence, things could deteriorate and eventually snowball out of control. This could also occur if the official explanation provided is deemed insufficient and unconvincing to the domestic and international public opinion. d- On the other side, regional and international human rights organizations pick up the news and spread it until it become headlines regionally and internationally. As for the international human rights organizations, if the incident was a minor one, it is recorded and retained to be included in their annual reports or annexed to other violations that may appear in separate press releases. However, if the violation is a major one, then it requires undertaking certain steps which start by contacting the authorities in the country in question. Many countries tend to provide timely responses to these groups explaining their positions and addressing the issue if it was deemed authentic. In these situations those human rights organizations would be satisfied and the matter would end there. When it comes to a country that typically delays its responses or not responds at all, the pursuing international organizations would send it a direct message and await the response, which more often than not either comes too late or does not come at all. Subsequently, condemning statements are issued by these groups relying on information they have received on the case, treating it as credible, even if it was one sided, and subsequently base their positions on it. e- In some cases when the abuse is of a greater magnitude and therefore waiting for days is not an option such as in cases that involve the detention of prominent figures or the death of people under torture, the international organizations swiftly issue an ‘Urgent Action’ memo while continuing to investigate and sending messages to the relevant authorities. f- These kinds of ‘Urgent Action’ memos entail the mobilization of all human rights supporters worldwide against the violation and the perpetrating state. Thousands of these people would move all at once in various directions; writing directly to the relevant authorities or to their embassies abroad, contacting the media in their countries to bring attention to the incident, petitioning their own government or parliament, organizing rallies in front of embassies and holding seminars. The United Nations and other human rights organizations are also contacted to support the same cause and adopt the same position. This ‘Urgent Action’ memo could be repeated depending on the developments in the case and would subsequently reaches governments in international forums and be raised during visits by foreign officials to the concerned state. As a result, the issue could stay alive for years. g- The campaign in these cases of violations could even go further. After the international public opinion is saturated with news of abuses and after the image of the concerned state is tarnished, it would then be politically cornered through meetings of the UNHRC or during the comprehensive periodic review. There may also be attempts to adopt resolutions or issue joint statements. Then these organizations would call for the curtailment of political, economic or strategic cooperation with the offending state. There might also be a push for punishing the state and besieging it politically and in the media and things may even go as far as justifying a military campaign (Syria, Iraq) or a diplomatic embargo and other restrictions (North Korea / Venezuela / Iran / Cuba / Russia). The realization of this process in human rights work should compel countries not to carry out any violations, address legal loopholes and quickly resolve the cases of violations so they do not spiral out of control thus leaving a significant impact that would develop negatively on the international arena.